BERKELEY, CA —Through photosynthesis, green plants and cyanobacteria are able to transfer sunlight energy to molecular reaction centers for conversion into chemical energy with nearly 100-percent efficiency. Speed is the key – the transfer of the solar energy takes place almost instantaneously so little energy is wasted as heat. How photosynthesis achieves this near instantaneous energy transfer is a long-standing mystery that may have finally been solved. A study led by researchers with the U.S. Department of Energy’s Lawrence Berkeley National Laboratory (Berkeley Lab) and the University of California (UC) at Berkeley reports that the answer lies in quantum mechanical effects. Results of the study are presented in the April 12, 2007 issue of the journal Nature. 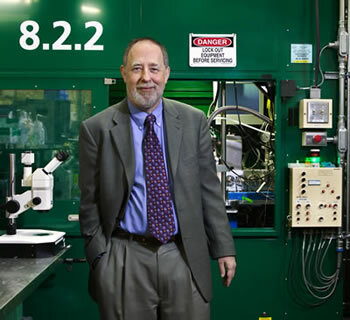 Fleming is the Deputy Director of Berkeley Lab, a professor of chemistry at UC Berkeley, and an internationally acclaimed leader in spectroscopic studies of the photosynthetic process. In a paper entitled, Evidence for wavelike energy transfer through quantum coherence in photosynthetic systems, he and his collaborators report the detection of “quantum beating” signals, coherent electronic oscillations in both donor and acceptor molecules, generated by light-induced energy excitations, like the ripples formed when stones are tossed into a pond. Electronic spectroscopy measurements made on a femtosecond (millionths of a billionth of a second) time-scale showed these oscillations meeting and interfering constructively, forming wavelike motions of energy (superposition states) that can explore all potential energy pathways simultaneously and reversibly, meaning they can retreat from wrong pathways with no penalty. This finding contradicts the classical description of the photosynthetic energy transfer process as one in which excitation energy hops from light-capturing pigment molecules to reaction center molecules step-by-step down the molecular energy ladder. 2-D electronic spectroscopy developed in the research group of Berkeley Lab’s Graham Fleming enables scientists to follow the flow of light-induced excitation energy through molecular complexes with femtosecond temporal resolution. In this 2-D electronic spectrum, the amplitude of the quantum beating signal for exciton 1 is plotted against population time. The black line covers the exciton 1 peak amplitude. The experimental data’s agreement with theory is shown on the right. 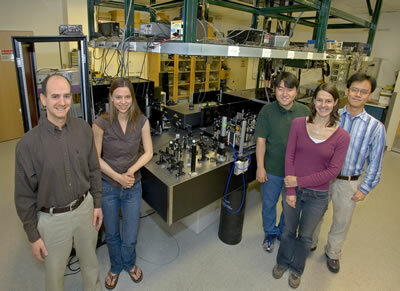 Co-authoring the Nature paper with Fleming were Gregory Engel, who was first author, Tessa Calhoun, Elizabeth Read, Tae-Kyu Ahn, Tomáš Mančal and Yuan-Chung Cheng, all of whom held joint appointments with Berkeley Lab’s Physical Biosciences Division and the UC Berkeley Chemistry Department at the time of the study, plus Robert Blankenship, from the Washington University in St. Louis. The photosynthetic technique for transferring energy from one molecular system to another should make any short-list of Mother Nature’s spectacular accomplishments. If we can learn enough to emulate this process, we might be able to create artificial versions of photosynthesis that would help us effectively tap into the sun as a clean, efficient, sustainable and carbon-neutral source of energy. Fleming has compared 2-D electronic spectroscopy to the technique used in the early super-heterodyne radios, where an incoming high frequency radio signal was converted by an oscillator to a lower frequency for more controllable amplification and better reception. In the case of 2-D electronic spectroscopy, scientists can track the transfer of energy between molecules that are coupled (connected) through their electronic and vibrational states in any photoactive system, macromolecular assembly or nanostructure. 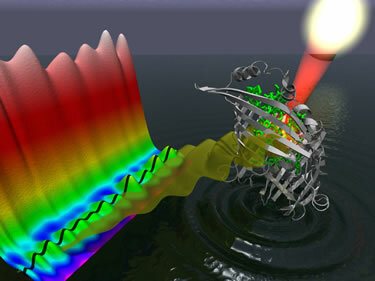 Fleming and his group first described 2-D electronic spectroscopy in a 2005 Nature paper, when they used the technique to observe electronic couplings in the Fenna-Matthews-Olson (FMO) photosynthetic light-harvesting protein, a molecular complex in green sulphur bacteria. As in the 2005 paper, the FMO protein was again the target. FMO is considered a model system for studying photosynthetic energy transfer because it consists of only seven pigment molecules and its chemistry has been well characterized. Engel said the duration of the quantum beating signals was unexpected because the general scientific assumption had been that the electronic coherences responsible for such oscillations are rapidly destroyed. Engel said one of the next steps for the Fleming group in this line of research will be to look at the effects of temperature changes on the photosynthetic energy transfer process. The results for this latest paper in Nature were obtained from FMO complexes kept at 77 Kelvin. The group will also be looking at broader bandwidths of energy using different colors of light pulses to map out everything that is going on, not just energy transfer. Ultimately, the idea is to gain a much better understanding how Nature not only transfers energy from one molecular system to another, but is also able to convert it into useful forms. This research was funded by the U.S. Department of Energy and by the Miller Institute for Basic Research in Sciences.